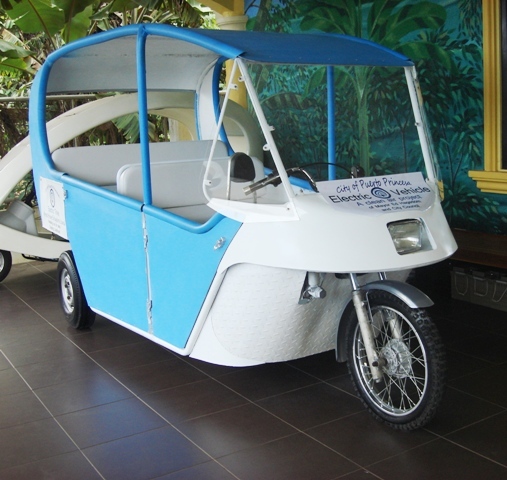 Mayor Edward Hagedorn of Puerto Princesa City, Palawan has recently ordered the first batch of forty (40) electric tricycles (eTrikes) to serve as taxis to and from the Puerto Princesa City International Airport. The eTrikes will be supplied by local assembler Green Tech EcoCenter (GTE) in partnership with PhUV Inc., the business arm of the Motor Vehicle Parts Manufacturers Association of the Phils. (MVPMAP). L to R: Dave Dewbre, ET developer, Mayor Ed Hagedorn, Diana Limjoco-GTE President, Helen Limjoco, Diana's mother. This is ET3 the prototype used to test the motors for the new ET4 Airport model. "Since the eTrikes will be locally assembled using a fiberglass body that is also locally made, this project not only helps clean the air in Puerto Princesa but also provides local employment and marginal businesses for local enterprises", says Mayor Hagedorn after inspecting GTE's prototype of the eTrike, the first ever fully assembled in Puerto Princesa. Et4 first prototype for PPC Intl. airport, fully assembled in Puerto Princesa by local workers. ET4 with removable doors on. He explains that his long-term vision is to actually replace all 4,000 gasoline-powered tricycles in Puerto Princesa City with eTrikes as part of his Clean Air Project aimed at preserving the blue skies and fresh air in the city. "Aside from helping protect our environment, this project will also transfer electric tricycle technology to our locals and enhance the skills of our local tinsmiths, welders, auto painters, auto mechanics, auto electricians, upholsterers, trimmers, assemblers and fiberglass makers". Diana Limjoco, GTE president, says that what GTE will make commercially available is the 4th generation of GTE's eTrike or the ET4. "This will be a full electric vehicle running solely on pure battery power. It will be powered by a 5 kw electric motor that can more than cope with large loads of luggage and six passengers comfortably seated, without straining the motor. This electric motor is of a more advanced technology as it is equipped with an internal cooling fan", she explains. 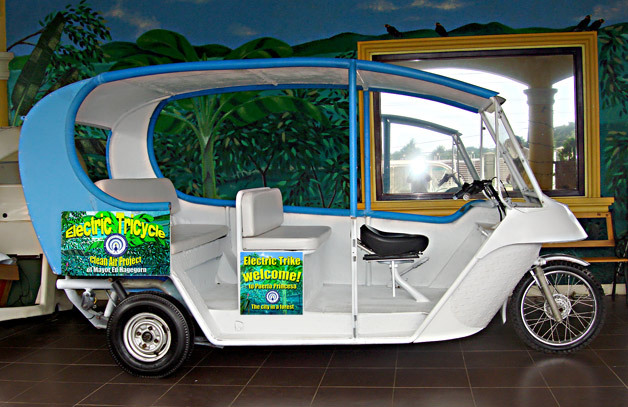 "The development of the eTrike has been fast-tracked as we are fortunate enough to have as our partner PhUV Inc., the assembler of the electric Jeepneys in Manila. They supplied us with some of the parts we needed and technology they themselves have acquired in their three-year experience in locally assembling and servicing eJeepneys. 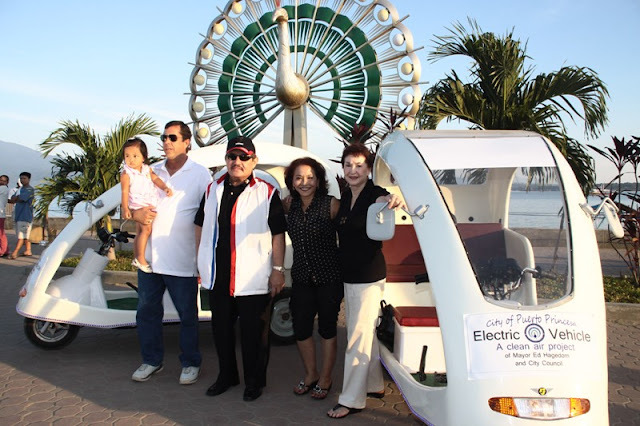 We believe that this partnership will produce an eTrike that will soon be a mini taxi, not only in Puerto Princesa but throughout the Philippines as well", she concludes. Hubby Dave Dewbre is the genius behind the breakthroughs in the new Et4 Electric trikes for the airport.